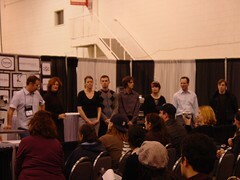 I just returned from the Great Lakes Regional Barista Competition. Here are the finialists, three from Inteligentsia Coffee and Tea, one from Coffee Hound, and one from Metropolis Coffee. The winner was Matt Riddle of Intelligentsia, Matt also won last year. Matt is an Indianapolis boy, he went to Pike High School, and IU. Matt is also the current United States Barista Champion. I was privilaged to judge the first round of this competition. I enjoy juding competitions more than compeating. I hope to have an Indianapolis barista compeating next year, perhaps even from Bjava!